Do you have long hair or are you growing your hair longer? Then it’s important to find a quality pair of hair-cutting scissors with sharp blades. Why get special hair-cutting scissors for attaining long hair goals? Because one of the best tricks to growing long, healthy, bouncy hair is regular “dusting” trims. “Dusting” is trimming just 1/4 inch from the ends of hair, sometimes even less if your scissors can handle it. Dusting is beneficial to anyone attempting to retain hair length while still removing split ends and giving hair movement, volume, lift and bounce. Dusting is a hair maintenance routine you can easily do yourself with a good pair of scissors. Dusting prevents split-ends from breaking further up the hair shaft, meaning tiny trims save hair length over time. But long hair is also fragile hair, so don’t use just any scissors on your lovely locks, invest in a hair-friendly scissors that can trim hair precisely and cleanly without the blades being dull and damaging the hair shaft. 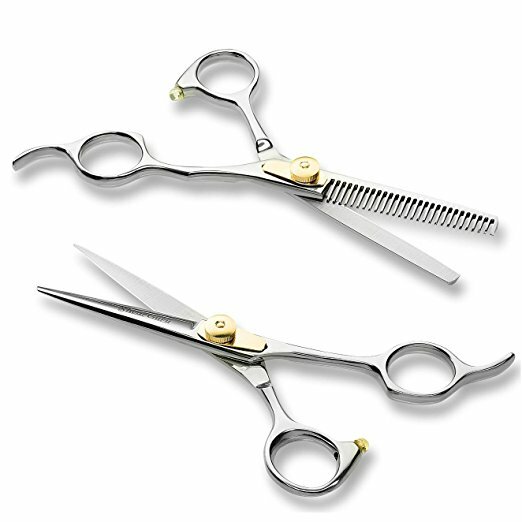 A quality set of scissors we like is the ShearGuru Professional Barber Scissor Hair Cutting Set. 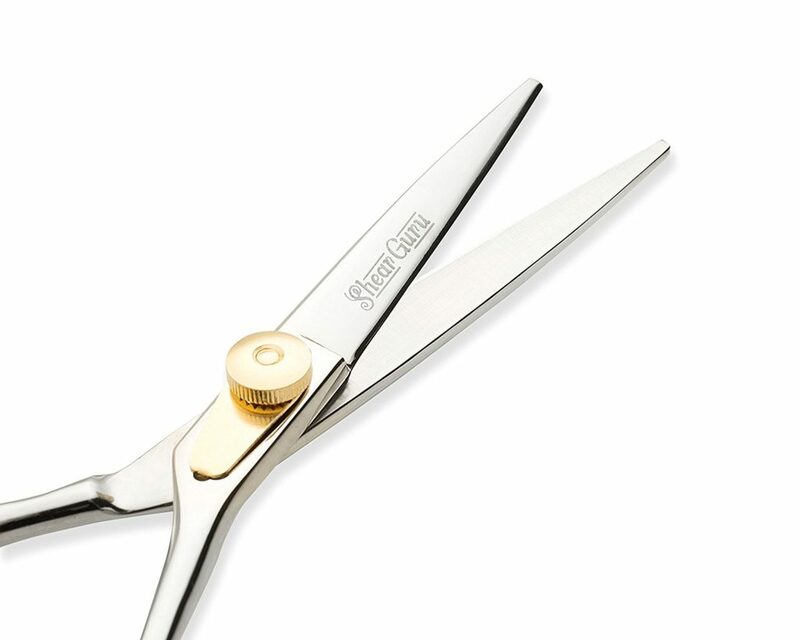 We especially like ShearGuru scissors because the blades stay sharp. The ShearGuru Professional Hair Cutting Set contains two pairs of scissors: a Straight Edge Hair Scissor and a Texturizing Thinning Shears. The set comes in a sturdy, thick faux leather zippered, hard leather case. Each pair of scissors is strapped across the body of the scissors with a strap and snap and has a triangular pocket to protect the scissor tips. The ShearGuru set is made of hand-sharpened Japanese stainless steel that retains its sharp edge up to 5x longer than regular stainless steel. Japanese Stainless Steel is a harder steel that requires less sharpening, and it is often used for high-quality Japanese chef knives. 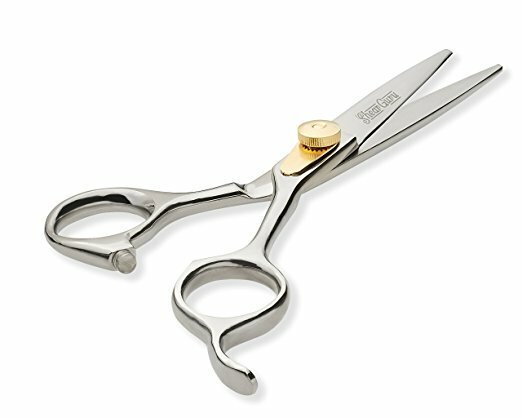 What does being made of Japanese Stainless Steel mean for the ShearGuru scissors? The blades won’t get dull. Suitable for both professional and at-home use, these are a great set for trimming your own hair or for doing family hair cuts. A dull blade can harm the hair because it may require several cutting attempts on the hair shaft to cleanly trim the hair strands, but a sharp blade makes one clean cut that leaves the delicate hair ends in good shape. This adjustable screw design means the blades move fluidly and won’t lock up, and an adjustable screw can slide the blade adjustment to custom fit your hand. 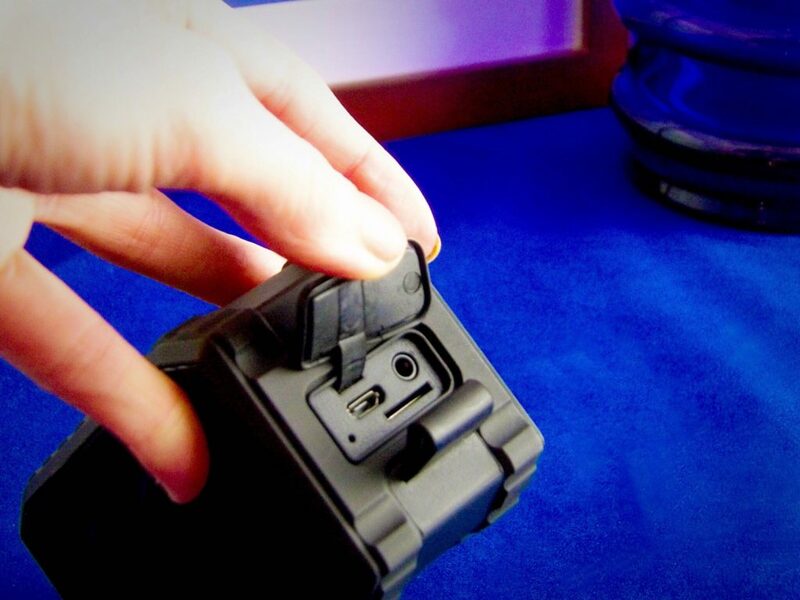 Keep the screw as tight as is comfortable for your hand grip. 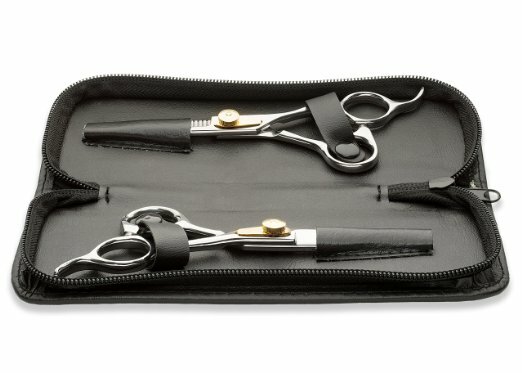 LIFETIME GUARANTEE: The ShearGuru Professional Barber Scissor Hair Cutting Set comes guaranteed. If you aren’t satisfied, SheerGuru returns your money, no questions asked. Both pairs of scissors are constructed well and are easy to handle and use; the loops are easy to grip, and the blades move smoothly. A feature I particularly like is the tension adjustment screw; it makes the motion of the blades when opening and closing a very smooth one. I like how easily they glided in movement during rapid trimming and did not get stuck or click during use. I was able to use the straight-edge scissors for very fine, precision trims of my hair and split-end removal, cutting just the tiniest lengths of hair exactly as I wanted. It is precise enough to focus just on cutting a single hair with a split or damaged end, and strong enough to blunt-cut thick sections of hair in a single stroke. I like not hacking away at hair trying to get a precise cut. If you like to gather hair into a ponytail and do a single blunt trim, ShearGuru scissors can do the trick cleanly and quickly. The ShearGuru texturizing scissors are very useful for curly, thick or unruly hair, or for adding texture to very straight hair ends for more movement. Curly hair can present challenges when cutting. If your hair is too curly to cut well with straight edge scissors, a texturizing scissors cuts about 40-80% of the hair per cut, giving more control over curled ends to see their shape, help them form and provide some structure. Comb through dry hair, and while holding the scissors so that the tips of the scissors are pointing up (towards the ceiling) trimming small sections at a time. For a cleaner edge, cut the same hair section again, but with the tips facing downwards. The curls will take on more definition without as much bulk. Ideally, with quality scissors such as the SheerGuru scissors, you can trim even less than 1/8″ inch about every three weeks, and your hair will still be noticeably healthier. It seems counterintuitive to growth, but removing such small amounts off the drier ends of hair is barely noticeable lengthwise and makes a huge difference in how the hair appears. 1. Only dust-trim dry hair. 2. Clip hair into four sections, and take one-inch sub-sections, and with the ShearGuru straight-edge scissors, trim less than 1/4 of an inch. 3. Once the one-inch hair sub-section is done, clip it away from the rest and take another section, and repeat until all your hair is trimmed. 4. Assess overall length of hair for evenness. HOW OFTEN TO DUST: Thicker, colored, or heavily processed hair should get a dusting about every four weeks, healthier, thinner or unprocessed hair can be about every six. As a rule, I dust my hair each time I touch up my hair color, about once a month. In a 2013 Glamour Magazine interview, Blake Lively said she trims her split ends by putting her hair into two braids and trimming off any split ends that stick out of the braids. This method does not replace full trims and regular dustings. It is, however, a useful idea for those with very long, layered hair. I found the SheerGuru Scissors easy to use for Blake’s method, the blades move fluidly and cut crisply and precisely. I also like to twist a section of hair and clip the little split-ends that stick out all along the sides of the twist. ShearGuru Professional Barber Scissor Hair Cutting Set is an ideal tool for the regular mini-trims that are necessary to grow long, strong, healthy hair. These trims can be easily done at home by yourself or by a friend by using these high-quality scissors. Suitable for professional and at-home use, these are sturdy, easy-to-grip scissors made of high-quality Japanese Stainless Steel. The cut is precise and clean. 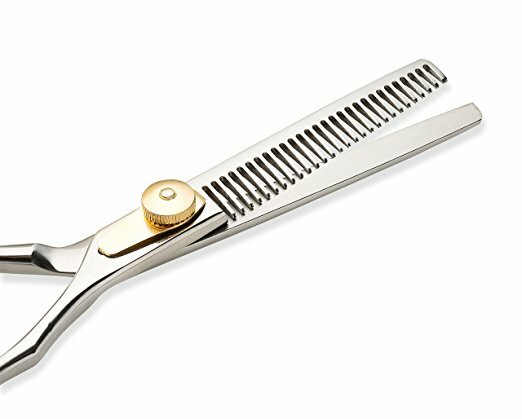 I like the natural, fluid motion of the scissors, easy to use and handle, and I especially like that the blades do not dull, meaning they not only cut with precision but that the blades are gentle and safe for trimming the fragile ends of long hair. To see how I use the SheerGuru scissors to give a trim to someone with hard to cut, very thick and curly hair, watch the video below. I use the texturizing scissors to at first cut through a cowlick of a curl to only thin out a curl to give it definition so that it is easier to cut and shape, then follow up with the straight-edge scissors to trim. Then at the 6:30 mark, see how quickly the SheerGuru straight-edge scissors removes split-ends from the length of hair using the twist and trim method described in the “Trimming Split Ends” subheading. I like a long, luxurious hot shower. The only thing that makes it better is an epic playlist to go along with it. 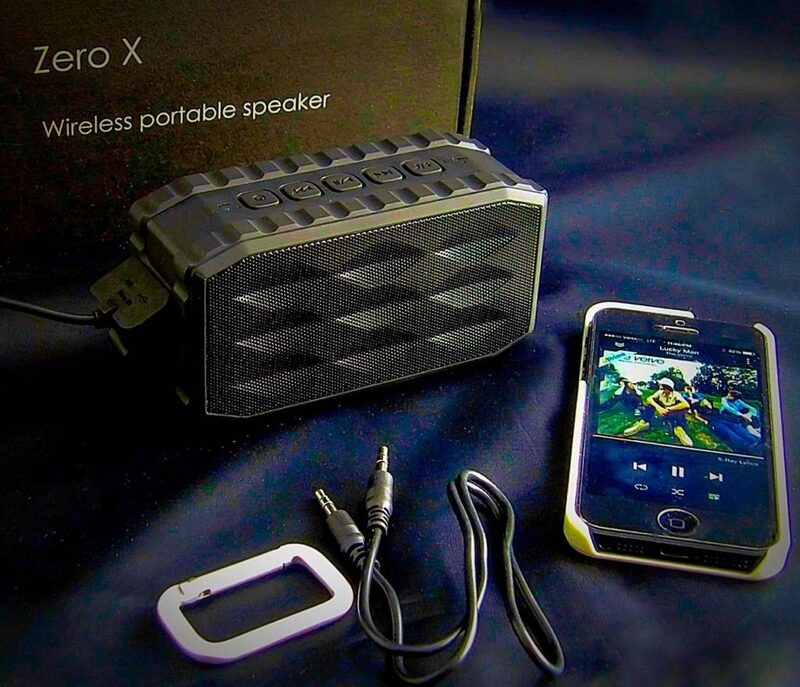 That is why I love the MARSEE Zero X Portable Bluetooth Speaker. First of all, it is waterproof, not just water-resistant. I’ve found that water-resistant speakers tend to konk out far too quickly. 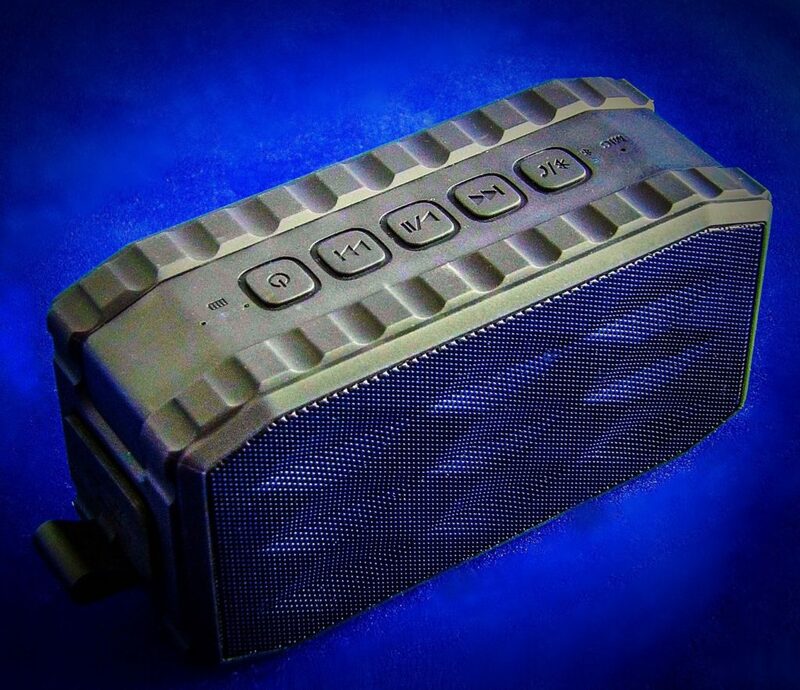 This speaker is so well crafted that water just isn’t getting in this little gadget. It has a hook, which I like to hook onto my shower caddy so it is handy. The sound is amazing. I laughed when I realized that the sound is better than on my actual iPhone. The bass is rich and deep. The instruments are nuanced, and the vocal is crisp. The sound is nice and loud without losing clarity. My Mom taught me the value of investing in good speakers when I was young, and as far as shower speakers, this is the best sound I’ve found. Here’s how I use it: I leave my iPhone in the adjacent room after pairing it with the speaker. I am always worried about my phone getting wet even if it isn’t near the water stream in the shower, but if it is in the next room, it works out great since it has a decent range. 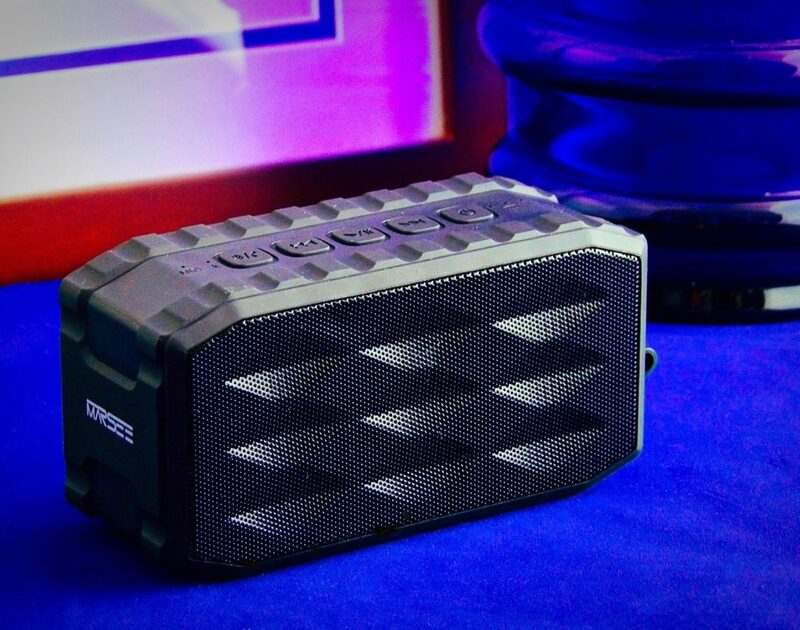 This is by far the easiest Bluetooth speaker I’ve used regarding connectivity. It automatically pairs with other Bluetooth devices. I just select the speaker in my iPhone’s Bluetooth list, and it pairs instantly. If you aren’t using the Bluetooth mode, it comes with an audio cable as well to directly link it to your phone. As a nice added bonus, it comes with a micro-SD card slot, so you can load up your music before you go, which is great for a picnic or if you have a standard playlist and don’t want to bother with pairing. It has an 8-hour battery life (the battery is rechargeable), so it will last through several showers or a few completely luxurious baths. It also has a microphone and can be used to answer phone calls. Though personally, if I’m enjoying a shower or bath, I want to be left alone. I can understand if you have kids, however, the need to always be reachable, so this is a nice feature. I don’t know if this happens to anyone else, but if I’m doing a timed beauty treatment in the shower, on occasion I’ll glance at the clock to be able to time my treatment, and then forget what time I started. Since I got this speaker, I don’t have that problem as I can load up a playlist with songs that are the timings of each step. For example, let’s say you are using Pravana Hair Color Extractor. Once you are in the shower, you massage in your shampoo and then you put a plastic cap over it for 2-3 minutes. Turn on your speaker, and have a song ready that is 2-3 minutes long. Pick songs that repeat that process for the entire 20-minute process. So when the song ends, you know it is time for the next cycle! That’s a whole lot easier (and enjoyable) than using a stopwatch or trying to figure out the time you started! I really enjoy this speaker. I’m picky about my sounds equipment, and speakers that I have tried that is this size tend to be tinny, but there is no trace of that in this speaker. I’m thrilled! Buy it here. Style Chicks readers get 15% off with code USDFTGTN. 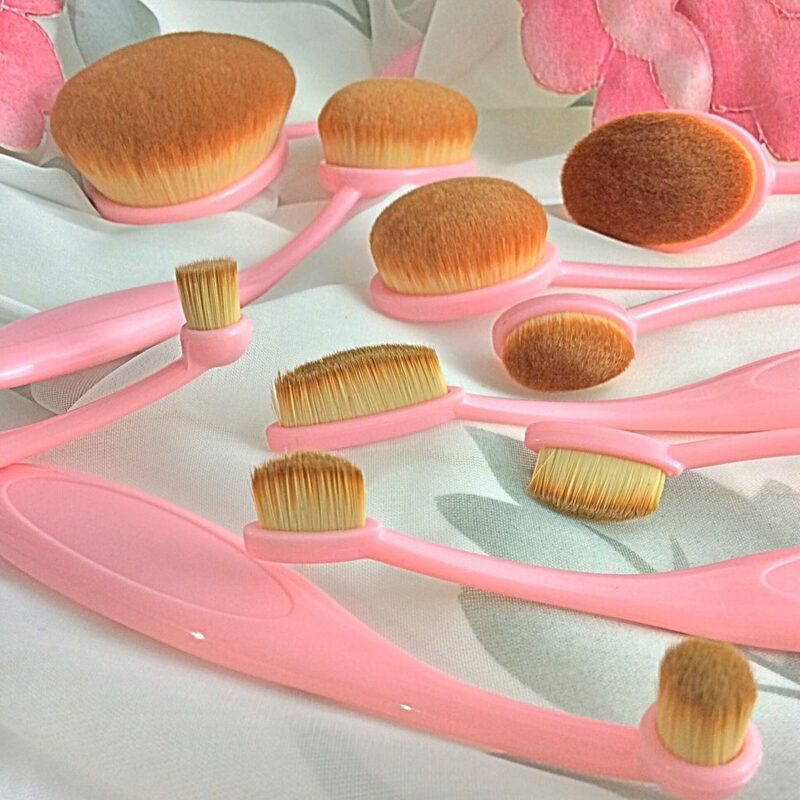 A few well-known high-end beauty brands have made the oval brush concept very popular. 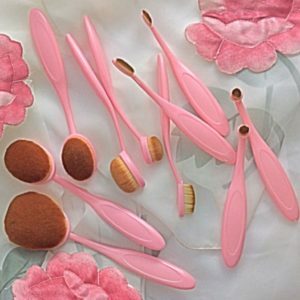 They look like tiny hairbrushes but have soft bristles intended for use on the face. 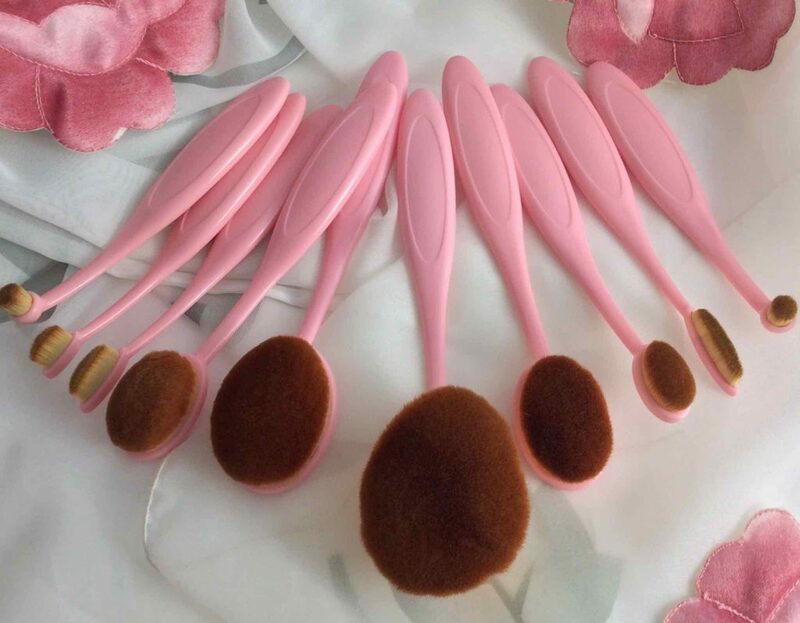 The benefits of oval brushes are that they have excellent control due to the handle shape, they can get into tiny crevices, and there is an incredible color payout. To see if an oval brush set is for you, a good set to try is the ten brush Startreasureland Oval makeup brush set. TIP: The key to finding an effective but reasonably priced oval brush is finding one with highly packed dense bristles. The Startreasureland Oval makeup brush set has ten brushes with very dense and tightly packed bristles give a very smooth makeup application that starts out light a thin opaque layer you can buff out to the desired degree of sheerness. 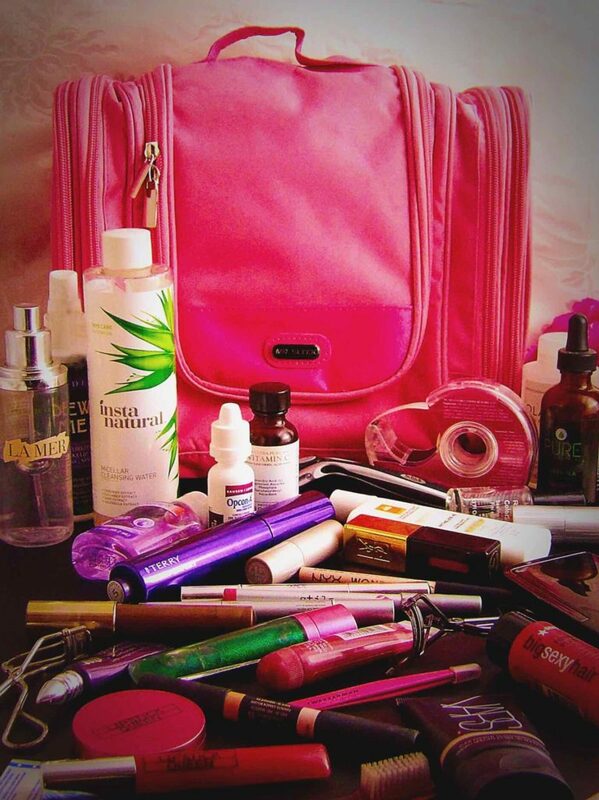 Both have their place in a good beauty arsenal. While awesome for sheer coverage, a Beauty Blender is less helpful when seeking natural looking opaque coverage, such as on areas such as the undereye area, blemishes, imperfections, or areas that need fuller coverage. So I apply my makeup with an oval brush and blend out to the desired sheerness when needed. The Startreasureland Oval makeup brush handles are ergonomic with a wide flat top and rounded easy to grip sides. They make it easy to angle around the face, so you can see what you are doing at any angle, whereas a regular foundation or concealer brush is the shape of a paint brush, allowing you to work your makeup at only one angle, which limits both visibility and blending ability. The two very large Startreasureland brushes in the set are for setting powder and foundation powder, applying makeup for body or applying powder over a large area. The second-largest can also be used to apply a face primer or even your moisturizer and sunscreen. While each brush can accommodate any makeup, a liquid or cream texture foundation is applied with the third largest to the medium size brushes, concealer and blush with the medium to the small range (brushes 4-6), and eyeliner and eyeshadow for the smallest and round head brushes. The small round heads are also useful for lipstick, spot blemish concealer application, eyeshadow crease/contour and the thin small heads work for eyeliner, contour, and eyeshadow. I was surprised how nicely the round brush applied a dark, heavily pigmented lipstick into a nice subtle layer of sheer tint, perfect for that transitional autumn timing. I was surprised by how large the foundation brush is, but when the sides are used, it draws a very defined contour line. The foundation brush maneuvers the angles of the face well. The concealer brushes (generally the 4-6 largest) get in well in the small crevices around the eye and that dark area between the nose and undereye under the brow. I love how sheer the oval brushes get foundation and concealer, even on bumpy areas. The most important thing I found when using these brushes, is that there is very little wasted makeup. I found with some brushes and sponges, my Beauty Blender type applicators especially, that I lost a fair amount of makeup that was soaked into the sponge, even when the Sponge is used damp. These brushes just help smooth out a thin layer and buff out to your desired level of coverage without wasting much makeup. In short, what you apply to your face directly and brush out, or what you apply to your brush and brush on, is what ends up on your face. It is easy to go heavy-handed at first. I was also surprised that the round head oval brush as a lip brush was as useful when applying lipstick. Even dark, sticky colors went on sheer and super even with no lumps or bumps. It took a few tries to get used to controlling the brush as a round tip directly on the lips instead of a side-to-side flat brush painting motion. CONCLUSION: The Startreasureland Oval makeup brushes are useful for powders, creams and liquid makeup – whether foundation, contour, eyeshadow, highlighter, cream blush or even lipstick. This is a very handy set of brushes that are well-constructed with well packed and dense bristles. There is a great color payout, and I love how sheer foundation appears on the face, and I especially like how much control it gives when applying contour, concealer, and eyeshadow. Quality set for a good price. 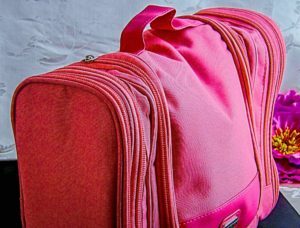 I have beautiful makeup brush rolls, but the problem with them is that they get dirty fast, and all the brushes being folded up together can cross-breed bacteria. Additionally, even with all brushes being laid out, I have trouble finding the exact one I want when I’m getting ready in a rush. So I’m very glad to have the ESARORA Cosmetic Brush Holder. 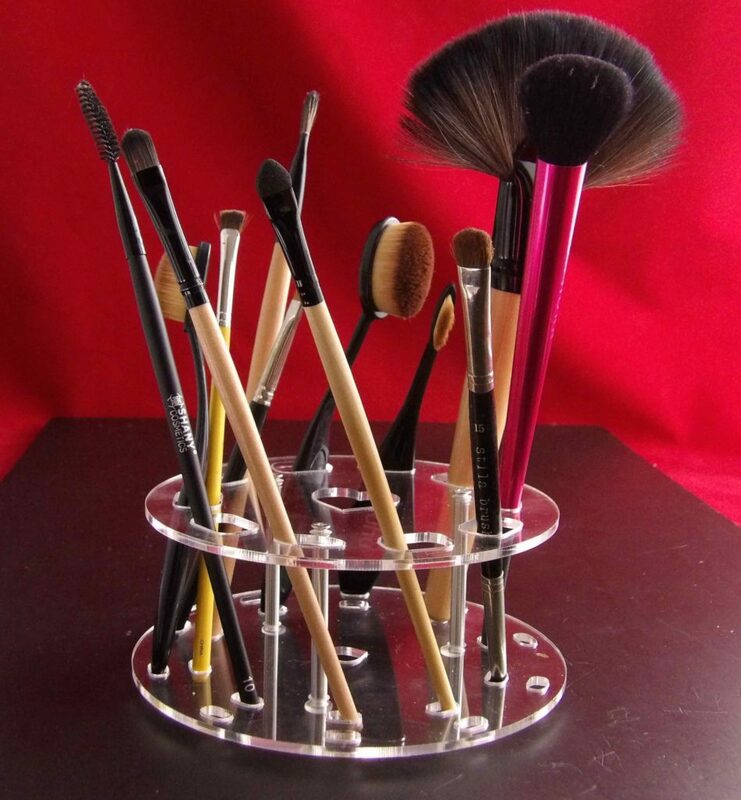 This brush holder has slots for ten makeup brushes. 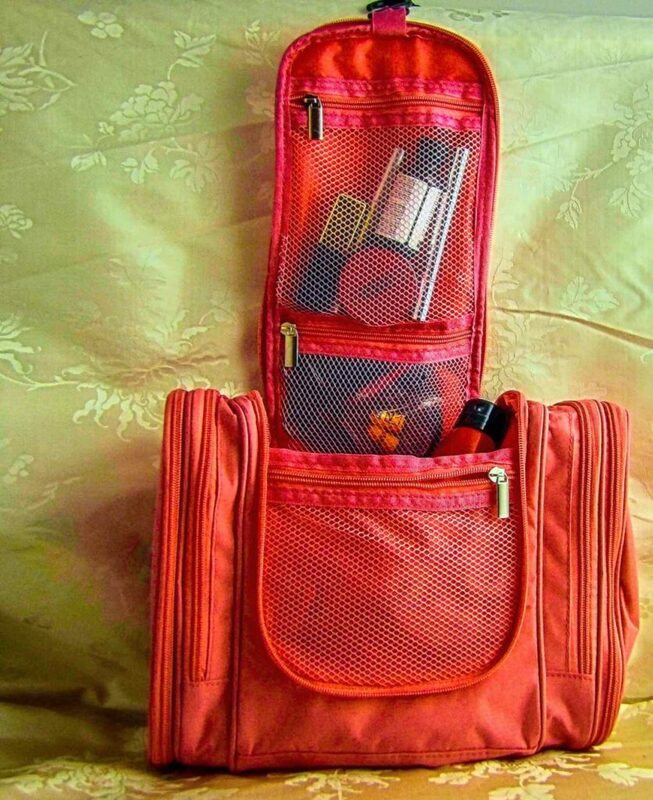 It holds even larger handled makeup brushes well for easy access. I like that I can see which brush is which easily, so getting ready quickly is far easier. The slots are also well placed. No two brushes end up touching, so dirty and bacteria won’t transfer between brushes, nor will color. Just yesterday I was using the brush I use for highlight on my eyes, and some dark smokey shadow had gotten on it from another brush when I had the brushes in a roll. 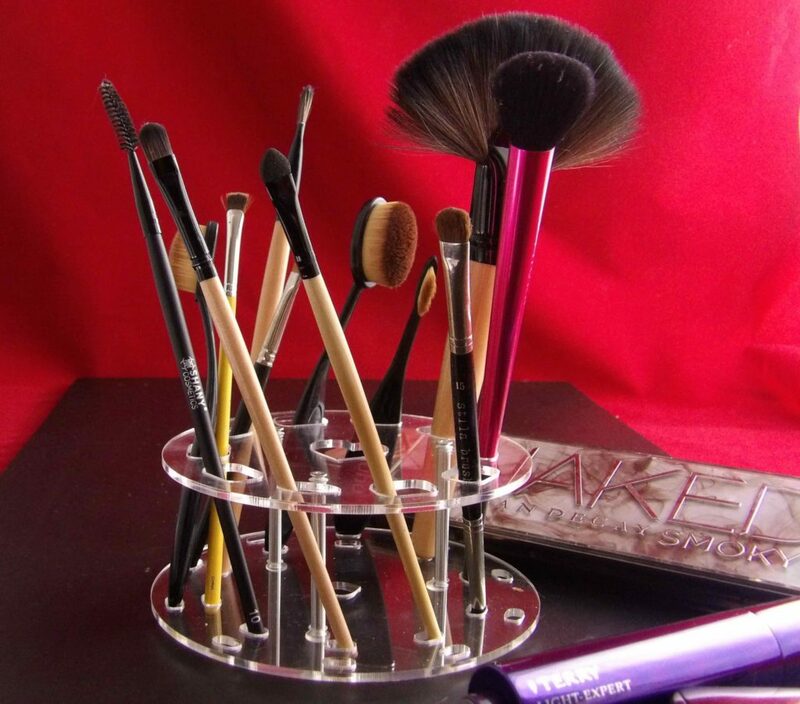 But with this brush holder, that won’t happen – no messy makeup cleanups! 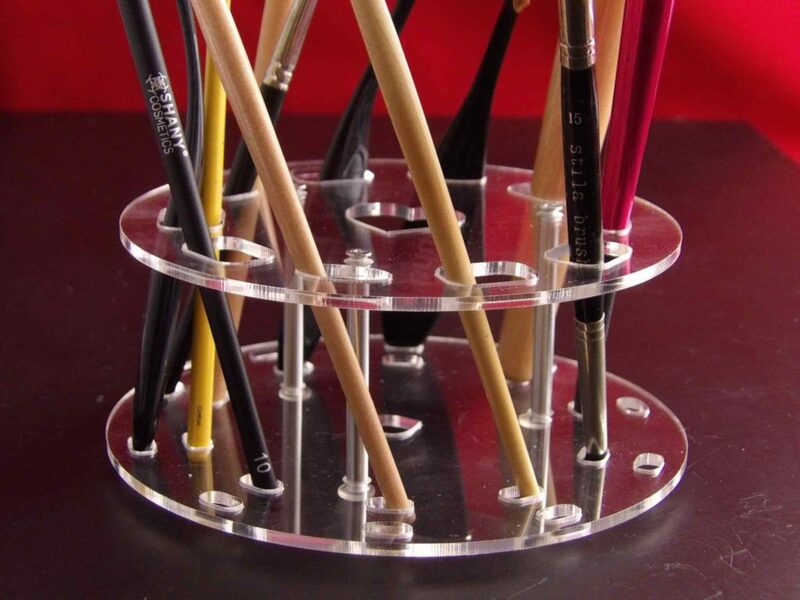 This brush holder is also fantastic for drying brushes after washing. Since they are standing upright, they keep their form when they dry, as opposed to when you lay brushes down their side when drying them and one side dries flat. Makeup brushes are an investment, and properly drying them will keep them usable for much longer! One tip: there are plastic films that protect the plates of the holder in the package that peel off. I found this a bit tricky, but the edge of a swiss army knife lifted it easily without scratching the pieces. Find this great brush holder at Amazon. I have received this product at a discounted rate for my unbiased review. If you have any questions about my experience with it, leave it in the comments section below, and I’ll do my best to answer it!